IBM's Stephen Linsdell will introduce the new IBM service 'Quick Security Check for IBM i' now available to IBM i users. What is worse? Going through a divorce, a car accident or, managing security administration? Research quoted in the IBM Systems Magazine confirmed that for many people security administration is the WORST. Security is an important built-in feature of the IBM i OS and its integrated database DB2. Security however, is only as good as its implementation. An inadequate knowledge can leave holes through which critical information may be vulnerable. Many industries have to comply with standards like Sarbanes-Oxley and company audit teams are also focussing more on IT security than ever before. Over the years, the IBM Lab Services and Training Security Team has assessed hundreds of systems. The Quick Security Check for IBM i lab service focused on the most commonly found security vulnerabilities as well as some of the lesser known ones in an IBM i environment. The Quick Check is a one off service, aimed at 'kick starting' you on the road to a secured IBM i by identifying your CURRENT vulnerabilities and exposures. Your next task is to fix current problems and ensure your iSeries stays secured on an on-going basis. You will see how you can get iSecurity to automate for you all those requirements... saving man power, reducing manual errors, keeping you up-to-date in real-time. Set iSecurity to continuously monitor all activities on the systems in real time, identify breaches, unwanted changes to settings or illegal, unauthorised accesses, and immediately deliver alerts / pre-defined responses , as well as regularly run your Audit and Compliance reports with an overall score of your iSeries' Security Compliance. 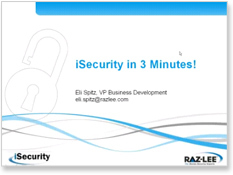 If you can not attend the webinar, and would like to receive the presentation and / or more information on iSecurity View, please email us or visit our website for iSecurity.